I dislike unboxing stories for one reason: They look like boasting. Look what I got! Before you did! That, and most companies these days unbox this stuff themselves. Skyrim's developer/publisher Bethesda Softworks did as much when they announced the Skyrim Collector's Edition back on August 5. You already know what's in the box. What do you need us for? I'm going to make an exception, because I want to fill this space with Skyrim stories, in turn because I'm having the time of my life with Skyrim, which I've been playing since last Friday. We're not allowed to review the game, so consider this officially not-a-review and just two words: heart-stopping. But the rest of you have to wait until November 11 to get your hands on the game (and November 10 to read the reviews), so here's a bunch of pictures confirming that yes, it's really going to happen, and the best part is, it'll happen on a Friday (instead of a Tuesday), giving way to the entire weekend, so make that three days, if you pick up Skyrim at midnight and take Friday off. The box itself is large and in-charge, around the size of the Gears of War 3 collector's edition, with Skyrim's lovely mountainscape painted on the wraparound sleeve. Inside: The Art of Skyrim art book, 200 pages of full-color illustrations and sketches. It's heavy. The cover and binding feel substantial. It has a foreword by the game's director Todd Howard, and commentary from the creative team scattered throughout. And that's all I know about it, because aside from some thumbing and sniffing (it smells like 'fresh book'!) I refuse to spoil the game by looking at any of the weapons, locales or new creatures early. 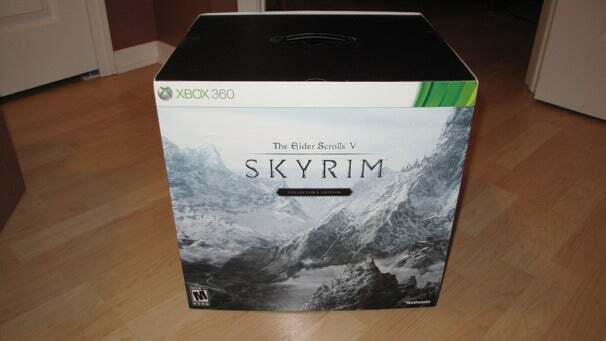 Also inside: The smaller slipcased box, which contains the game DVD and The Making of the Elder Scrolls: Skyrim (also on DVD). I watched the 'making of' disc, which runs about 20 minutes, and can say it's essentially spoiler free. You'll glimpse a few creatures and locations that don't come along until later, but the footage is all early game stuff, and the brief overview of why they picked the whole "dragonborn" and "dragon shouts" hero path is all public knowledge. It's as insightful as spoiler-free making-of videos can be, offering views of Bethesda's work environment and clarifying the company's design philosophy around the Elder Scrolls games. Meet the coup de grace, Alduin the dragon, a 12-inch tall PVC statue. It's a two-piece model, the base "dragon wall" and Alduin himself. The cool part: Alduin "perches" on the wall without tethers. Just set him on the wall per the included diagram sheet and presto, there he sits. Last but not least, the map of Skyrim, which actually comes with the standard game as well (or at least it did with my retail review copy). The map's printed on high quality paper stock, so if you're the sort that likes to pin up or even frame this stuff, the map's a step up from the one Bethesda shipped with Morrowind.